The Beckman Coulter Avanti J-26 XPI is a high performance large volume refrigerated centrifuge able to handle the everyday demands of high throughput laboratories. The Avanti J-Series from Beckman Coulter delivers top quality, flexible centrifuge performance with greater separation forces for large volume applications, up to 6 liters worth, or up to 24 microplates at once (rotor dependent). This floor model centrifuge runs at a top speed of 26,000 RPM, or 82,000 x g and has a temperature range of -10°C to 40°C. Additionally, the low noise, low heat output Avanti J-26 XPI has automatic rotor identification, with automatic temperature compensation unique the rotor, and features a brushless switched reluctance drive motor. The Beckman Avanti J-26 XPI Centrifuge can handle a wide variety of applications from rapid sedimentation, pelleting, purifications, separating blood components, bacteriophage isolation and much more. 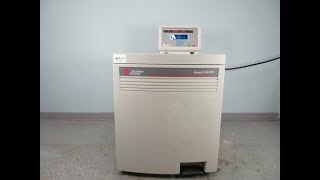 This robust refrigerated centrifuge comes equipped with 12 acceleration and thirteen deceleration programs, that include slow start and stopping for more delicate samples. This can be adjusted along with speed, time and temperature, all controlled from the intuitive brightly lit digital display that provides real time at-a-glance stats or can be toggled to show the users settings. This refrigerated centrifuge will also alert users to conditions that may need attention through the control panel. For added convenience and ergonomic comfort, this floor model centrifuge has a foot pedal in the front for easy access with fully hands. This Beckman Avanti J-26 XPI Floor Model Centrifuge has been fully inpsected, and tested for temperatures and at the maximum speed for each of the rotors, both operated without issue . All of our lab equipment comes backed with our standard warranty. Should you have any questions, please don't hesitate to contact us.